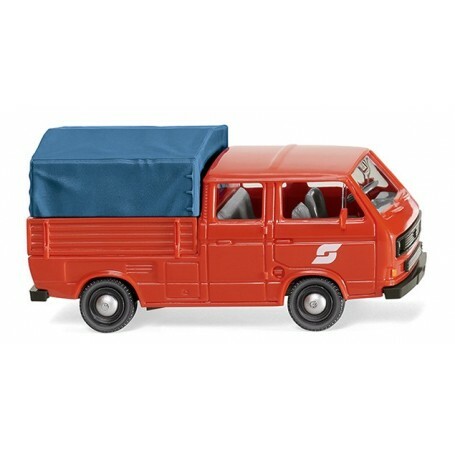 VW T3 crew cab 'ÖBB', 1979. Body and flatbed in blood orange, chassis with radiator grille and air intake in umbra grey. Interior with integrated steering wheel dust grey. Wheel rims umbra grey. Front indicators imprinted orange, tail lights imprinted carmine red. VW logo on radiator grille in silver. Headlamps hand-painted in silver. ÖBB logo printed in white on the side.